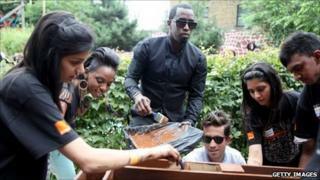 Music mogul P Diddy has rolled up his sleeves to help out volunteers at an adventure playground in central London. The rapper was at Toffee Park Adventure Playground and Youth Centre in Clerkenwell with up to 50 helpers. P Diddy, who uses the stage name Diddy outside the UK, was invited to paint a canvas which is being displayed on the site. His visit came ahead of his performance at the Orange RockCorps gig at Wembley Arena in north-west London. The playground was designed and created 20 years ago by local students who saw a need for a safe and secure place for children to play. Volunteers from the Orange RockCorps programme - which offers people tickets for music concerts in exchange for four hours of community work - help maintain Toffee Park.